First, improving our knowledge of weather processes and phenomena is crucial in gaining an understanding of the Earth system. Second, there is an infrastructure in the U.S. for operational meteorology at NOAA, the FAA, the DoD, and other agencies that requires the introduction of new technologies and knowledge that only NASA can develop. NASA has been a strong contributor to the National weather forecasting goals in the past, and will continue to be in the future, primarily through the development and use of data from space-based sensors. Satellite-based profiles of temperature and moisture have been routinely used in operational forecasting for more than 20 years, and new NASA sensors hold promise for more accuracy and spatial resolution. A geostationary Lightning Mapper Sensor (LMS) is providing dramatic improvements in the operational use of sounding data for real-time diagnosing of severe storms. Recent developments in assimilating radar and passive microwave data from TRMM and the Advanced Infrared Sounder (AIRS) data from Aqua have improved weather forecasts. Further advances in predictive capabilities will come with data from the GPM satellite, which can measure falling rain, snow, and ice in light to heavy quantities and cover the entire globe every three hours. The Weather focus area also leverages and supports technologies developed by NASA’s Earth Science Technology Office (ESTO) such as the In-Space Validation of Earth Science Technologies (InVEST) program (RainCube and CIRis) and the EV class missions such as CYGNSS and TROPICS. How can weather forecast duration and reliability be improved? What can we do to improve the capability to predict weather and extreme weather events? What impact does the large-scale environment, particularly the Saharan Air Layer, have on hurricane intensity change? What is the role of storm internal processes such as deep convective towers? To what extent are storm intensification processes predictable? How can we use NASA satellite and airborne observations in the day-to-day weather forecast operations at our partner agencies? Weather Research is primarily designed to apply NASA scientific remote sensing expertise to the problem of obtaining accurate and globally distributed measurements of the atmosphere and the assimilation of these measurements into research and operational weather forecast models in order to improve and extend U.S. and global weather prediction. The Weather focus area is directly related to the Climate and Water/Energy Cycle focus areas, where the dynamics are to a large degree controlled by "weather processes." NASA-sponsored research continues to gain new insight into weather and extreme-weather events by the utilization of data obtained from a variety of satellite platforms (TRMM, GPM, Aqua, Terra, Suomi NPP, CloudSat, CALIPSO, and CYGNSS) and a hurricane field experiment. NASA's Precipitation Measurement Program missions TRMM and GPM provide advanced information on rain and snow characteristics and detailed three-dimensional knowledge of precipitation structure within the atmosphere, which help scientists study and understand Earth's water cycle, weather, and climate. 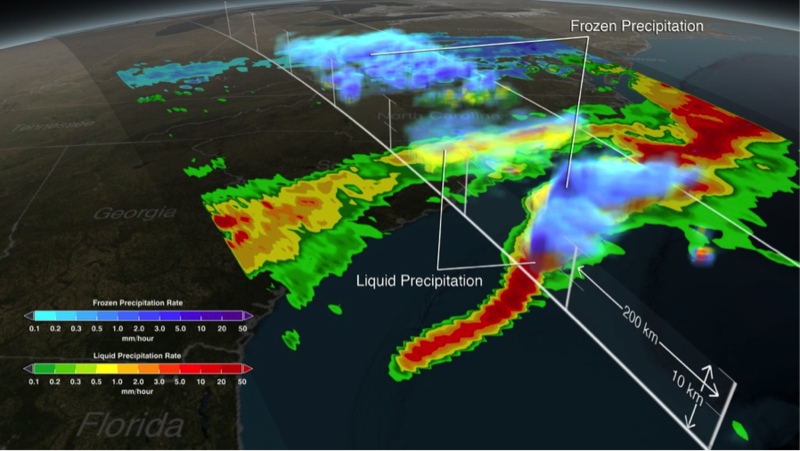 This visualization of data from the Global Precipitation Measurement (GPM) satellite shows a U.S. East Coast snow storm on March 17, 2014, captured a few weeks after the satellite's February 27, 2014 launch. Shades of green to red indicate areas of liquid precipitation. Shades of cyan to purple are areas of frozen precipitation. GPM is the first satellite to differentiate between liquid and frozen precipitation. Research by Gail Skofronick Jackson (NASA/GSFC), Dalia B. Kirschbaum (NASA/GSFC), and George Huffman (NASA/GSFC). Visualization by Alex Kekesi (GST) (Lead), Greg Shirah (NASA/GSFC), and Trent L. Schindler (USRA). Atmospheric Dynamics includes the CYclone Global Navigation Satellite System (CYGNSS) mission that uses a constellation of eight small satellites carried to orbit on a single launch vehicle. CYGNSS's eight micro-satellite observatories receive both direct and reflected signals from Global Positioning System (GPS) satellites in orbit. The direct signals pinpoint CYGNSS observatory positions, while the reflected signals respond to ocean surface roughness, from which wind speed is being retrieved. The surface wind speed is obtained even under heavy precipitating conditions. The mission studies the relationship between ocean surface properties, moist atmospheric thermodynamics, radiation, and convective dynamics to determine how a tropical cyclone forms, whether or not it will strengthen, and, if so, by how much. Precipitation Science includes the studies that will aid the development of Precipitation and All-weather Temperature and Humidity (PATH) mission designed to place a microwave atmospheric sounder, operating in the same temperature and water vapor bands used by the low-Earth-orbiting Advanced Microwave Sounding Units (AMSU), into geostationary orbit. The objective is to enable time-continuous observations of severe storms, tropical cyclones, and atmospheric processes associated with the hydrologic cycle under all weather conditions. The ultimate goal is to improve models in these areas, provide initial conditions and assimilation of data for improved forecasts, and develop long time series to support climate studies. Hurricane Science includes the Hurricane and Severe Storm Sentinel (HS3) Mission, a five-year effort involving three deployments to the Wallops Island Flight Facility on the Virginia coast during the 2012 and 2014 hurricane seasons using two Global Hawk (GH) unmanned aircraft systems (UAS) with distinct payloads. Additionally, the Convective Process Experiment (CPEX) was competitively selected as part of the Research Opportunities in Space and Earth Science 2016 (ROSES) to help answer questions about convective storm initiation, organization, and growth. CPEX took place in the North Atlantic-Gulf of Mexico-Caribbean Sea region from May 25 - June 25, 2017. CPEX was the first field campaign that collected airborne observations continually from pre-tropical disturbance in the Caribbean Sea, to tropical depression, and subsequent formation of Tropical Storm Cindy in the Gulf of Mexico prior to landfall in Louisiana on June 22, 2017. Wind Lidar Science includes the studies that will aid the development of Three-Dimensional Tropospheric Winds from Space-based Lidars (3D-Winds). Measurement of global wind profiles is recognized as a primary unmet observational requirement for improving weather forecasts by the World Meteorological Organization and many international operational weather agencies. The wind field plays a unique dynamical role in forcing the mass field to adjust to it at all scales in the tropics, and at smaller scales in the extratropics. Direct observation of the global wind field would be extremely valuable for numerical weather prediction, as well as scientific diagnostics of large-scale atmospheric transport, weather systems, and boundary layer dynamics in Earth's atmosphere. The Global Modeling and Assimilation Office (GMAO) aims to maximize the impact of satellite observations in climate, weather, and atmospheric composition prediction using comprehensive global models and data assimilation. To achieve this goal, the GMAO develops models and assimilation systems for the atmosphere, ocean, and land surface; generates products to support NASA instrument teams and the NASA Earth science program; and undertakes scientific research to inform system development pathways. The Joint Center for Satellite Data Assimilation (JCSDA) is a partnership among NASA, NOAA, and DoD. Its mission is to accelerate and improve the quantitative use of research and operational satellite data in weather, ocean, climate, and environmental analysis and prediction models. This visualization depicts Hurricane Sandy's near-surface winds on October 28, 2012 from a 7-kilometer simulation using the Global Modeling and Assimilation Office (GMAO) GEOS-5 global atmospheric model. The NASA model not only produced an accurate track of Sandy, but also captured fine-scale details of the storm's changing intensity and winds. 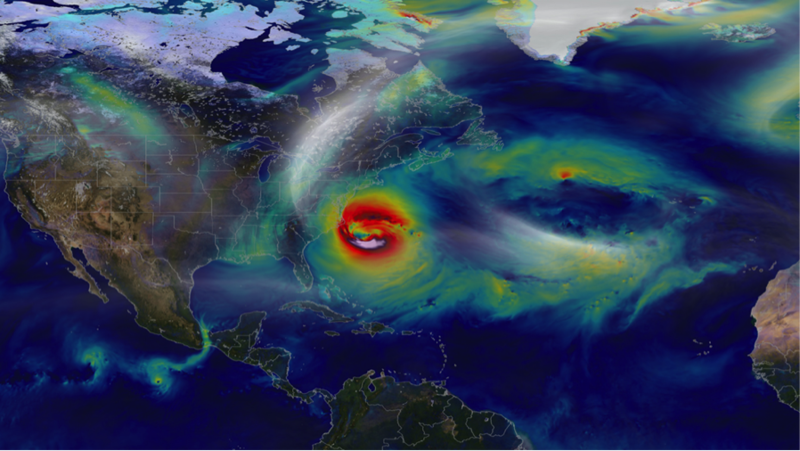 The GMAO is running high-resolution global simulations at the NASA Center for Climate Simulation to help improve prediction of hurricanes and other weather phenomena. Research and visualization by William Putman (NASA/GSFC). The Short-term Prediction Research and Transition (SPoRT) Center transitions the data products from NASA research satellites to the NOAA National Weather Service (NWS) Weather Forecast Offices (WFOs). The goal is to improve short-term forecasts on a regional scale. The table below lists all Earth missions that are relevant to the Weather Focus Area in all phases. Learn more about the mission phases: operating, under development, under study, and past. For solicited program elements relevant to Weather, search for and view open, closed, and future Research Opportunities in Space and Earth Sciences (ROSES) NASA Research Announcements (NRAs) on the NASA Solicitation and Proposal Integrated Review and Evaluation System (NSPIRES) website.